Hello again. I’m glad you are still following me in my analysis of the Ashes core set preconstructed decks (because you are still following me, aren’t you?). 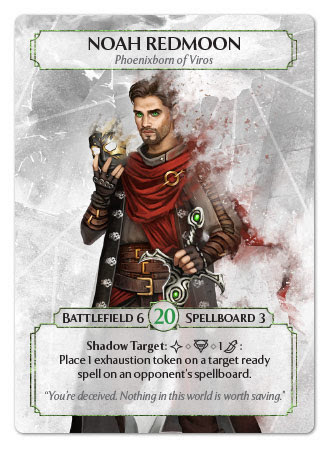 Today, we’ll take a look at what has been labelled by many as the “weakest” preconstructed deck: Noah Redmoon’s The Shadows of Viros. Is this true? Maybe. For sure this deck is somewhat trickier to use than the other five, and it’s definitely not recommended for first-time players. I don’t want to get too deeply into this debate, this is not the purpose of this article, so I’ll state my own personal opinion and go on. To me Noah’s deck is not much weaker than the other preconstructed decks, but compared to them it requires the player to take an extra step, both in knowledge of the game mechanics and in strategic thinking, in order to be played properly. 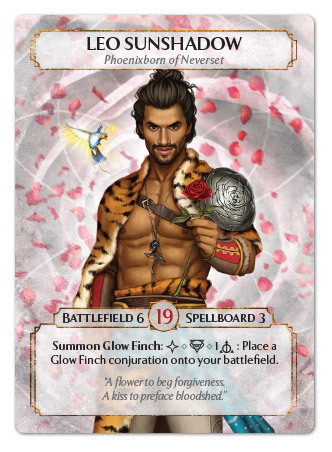 This said, many of his cards do have a place in constructed play, Noah himself first, and should not be underestimated. With an above-average life value of 20, and a quite good 6 Battlefield, Noah Redmoon, Phoenixborn of Viros, is definitely ready for fighting. He has plenty of room for units big and small, and has no problems whatsoever in taking one or two hits for the cause in a way similar to Maeoni Viper: with few ways to deal direct damage, and with incredibly fragile units, Noah needs to protect his army from enemy attacks if he wants to have a chance to significantly harm the enemy Phoenixborn. His low spellboard value of 3 might seem as a disadvantage at first, as he’ll have to focus on a few, selected spells, thus lacking he variety of options other Phoenixborn have. 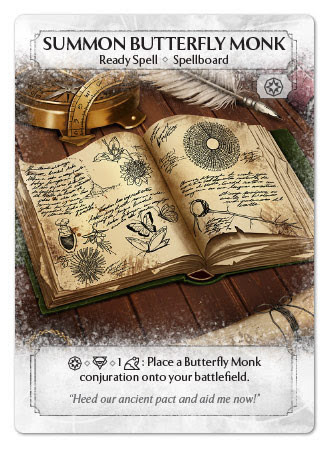 On the other hand, ready spells are open information to all players: with most of your strategy relying on the cards in your hand, your opponents will have a harder time predicting your moves. Also, Noah’s special ability, Shadow Target allows him to exhaust an opponent’s ready spell by spending a side action and a Ceremonial die. 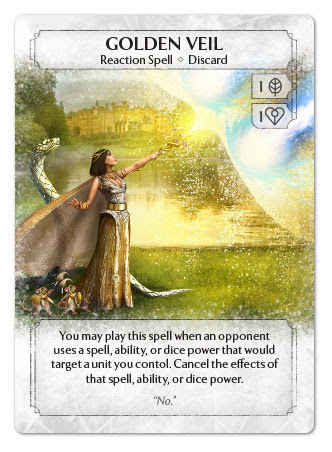 As the vast majority or ready spells requires a main action to be played and another main action to be activated, Noah can basically spend 1 die to negate an opponent’s turn and disrupt their game. As the game progresses, the effectiveness of Shadow Target wanes as the opponents can play (and focus) more ready spells while you can only exhaust one each round. Nevertheless, its value in the first round of the game is incredible, as it can disrupt the opponents’ First Five and force them to reconsider their opening moves. Illusion is pivotal in Noah’s gameplay, as it adds another layer of disruption to his kit. The ability to exhaust enemy dice through the Illusion Dice Power is a useful tool to restrict enemy options or to negate them altogether, and is even more powerful in constructed play, where decks running on 3 dice types are quite common. 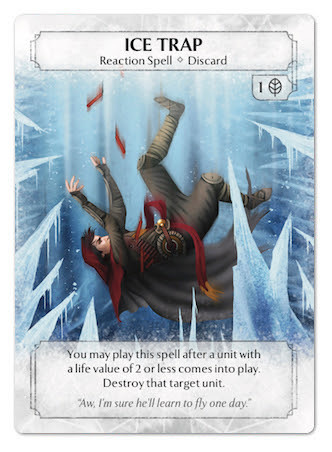 But even if you can’t completely shut down an opponent’s dice type, you always have the chance to remove Power Dice from that player’s active pool, forcing them to meditate (and thus, lose resources and/or tempo) to regain them. 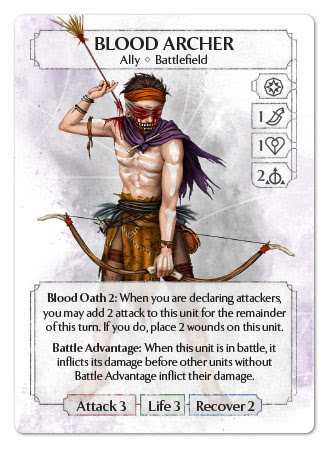 On the other hand, this deck is not as ally-heavy as other preconstructed decks that use Ceremonial dice, but still features some typical Ceremonial themes such as unit sacrifice and revenge. 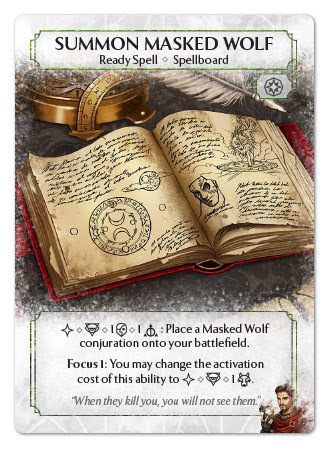 Noah’s special card is Summon Masked Wolf, which has the unique ability (at least until Leo Sunshadow gets released) to summon a unit with a Side Action. 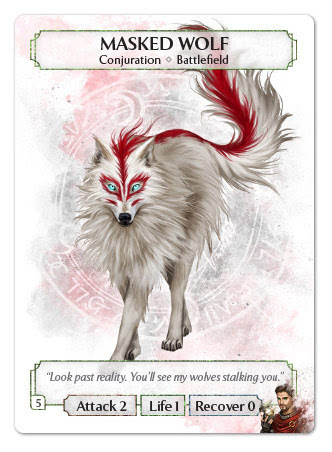 This means you can summon a Masked Wolf and attack with it in the same turn, allowing it to deal damage before the opponent can destroy it with a Nature Power or other 1-damage effects. The base summoning cost for the Masked Wolf is 1 Illusion and 1 Basic, which is quite high for a 2 attack/1 life unit, but after focusing the spell, you have the option to change it to a single Illusion Power Die. Yes, a Power face is harder to get, but spending 1 die instead of 2 is a great deal, and meditation is always a good option, especially with Illusion dice. 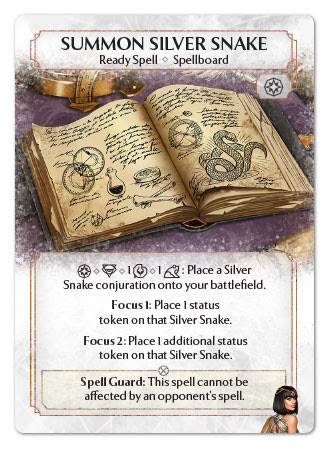 The big drawback is that you can’t meditate and activate Summon Masked Wolf in the same turn (as you could do for example with Summon Silver Snake or Summon Butterfly Monk): you should always have some Illusion Power Dice available beforehand, which, by the way, is almost never a bad option, as you can always use them to exhaust enemy dice. Noah’s main strategy is to make his opponents waste resources and to take them by surprise with a series of low-damage, hard to avoid attacks. While Summon Masked Wolf is one of his main attack tools, his other Ready Spells help him deal with potential threats. 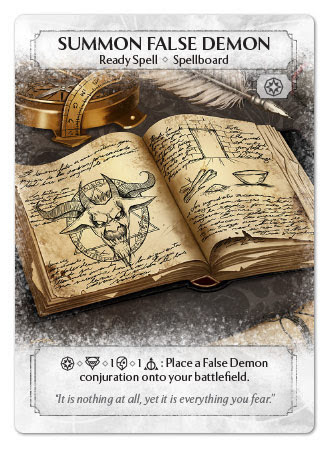 Summon False Demon is a relatively cheap summoning spell, that brings into play a 1 Attack / 4 life conjuration with Unit Guard for an Illusion and a Basic dice. 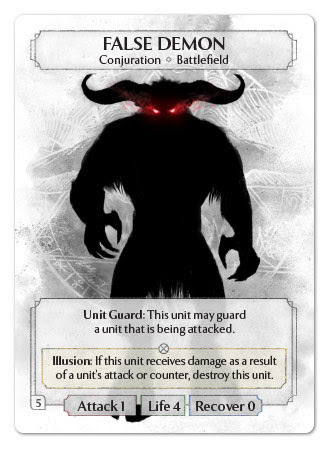 At first sight, the False Demon is a wonderful blocker… it’s one of the units with the best stats-to-cost ratio the game, so it has to have some sort of drawback to balance its high toughness out, don’t you think. Unfortunately, it does: the Illusion ability forces you to destroy the False Demon when it takes damage from an attack or counter, so even if it can block for Noah or guard another unit, it will only last for a single attack, no matter how low it is. Nevertheless it has its value, though, as appropriate to its magic type, it’s a little tricky to use. 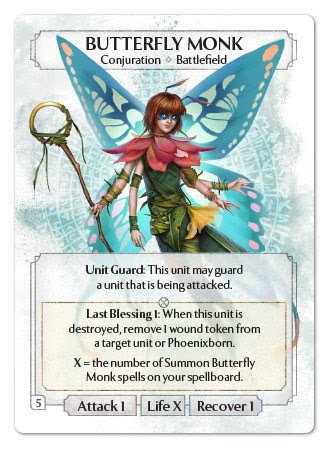 First of all, it doesn’t die to unit damage as easily as other blockers, like Gilders or Butterfly Monks: your opponent will take a greater effort in taking it down with spells and dice power than you did to summon it in the first place. It will die after blocking, sure, but it will likely survive until that moment, whereas cheaper but weaker units won’t. 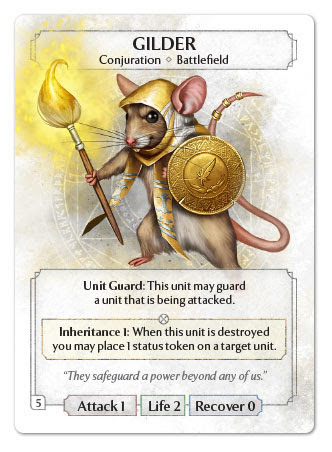 And if the opponent attacks it, either they send in a small unit to trigger Illusion, to which you answer by guarding with Noah, or they swing hard, overcommitting to eliminate a 2 dice unit. I call it a win-win situation. Furthermore, 4 life makes the False Demon immune to cheap removal effects like Ice Trap, making it safer to get into play than Gilders or Butterfly Monks. Another reason to play with False Demons is Noah’s third Ready Spell: Small Sacrifice. 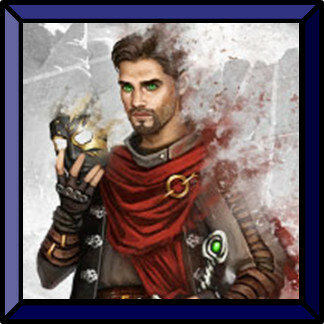 For a Main Action and a Ceremonial Class die, this spell allows you to replicate the Nature Dice Power and deal 1 damage to an enemy unit… as long as you are willing to deal 1 damage to one of your own. No pain, no gain: that’s the nature of Ceremonial magic. 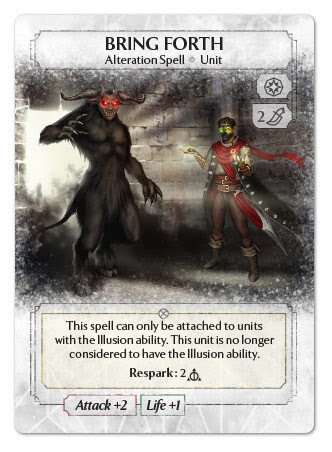 In a deck where every other unit has a Life value of 1, False Demon become an almost obvious choice to suffer this effect, but you can also get rid of exhausted units to gain some extra value out of them, or to make room in your battlefield. When focused, this card gains an alternative ability, allowing you to exhaust both yours and your opponent’s unit (as long as no one was already exhausted) instead of dealing damage. Whereas the first effect helps you to clear the board from small targets, this one helps you to deal with large threats like Hammer Knights or Blood Archers. It’s a bit expensive, it’s a bit slow, but it does its job quite well. As a final note, remember that “deal of 1 damage to a target unit on your battlefield” part of the ability is part of the effect, not a cost (the same goes for exhausting of a unit on your battlefield if Small Sacrifice is focused), thus if its effect gets cancelled by cards like Golden Veil, your units won’t take damage or be exhausted. The Shadow of Viros includes a single ally: the Stormwind Sniper. 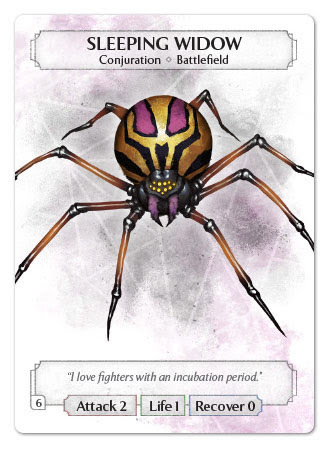 With a cost of 3 dice (1 Illusion, 1 Ceremonial and 1 basic) for 2 attack and 1 life it can seem overpriced, and it definitely falls in the high end of the spectrum, but its Ambush 2 ability compensates it. Consider this: for 3 dice you deal 2 damage to an enemy unit or Phoenixborn and you have a 2/1 unit on the battlefield. 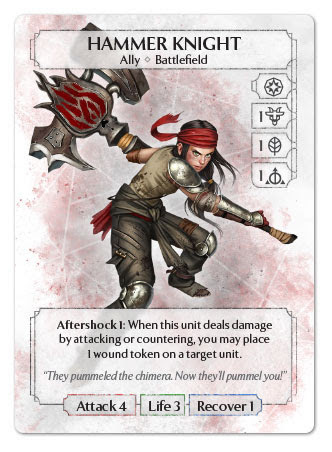 Unless the opponent does something about it (possibly spending 1 or more dice), you threaten to deal 2 more damage. So basically most of the times you have gained either 4 damage, 2 damage and a blocker or 2 damage and 1+ dice spent by the opponent for the cost of 3 dice; each of these options look quite good to me. The only issue I have with the Sniper is its cost per se, rather than what it brings to the table. 3 dice are always a big investment – about a third of your dice pool, and will most likely give your opponent a significant dice advantage for the current round if you spend them too early. Noah uses his Action Spells to increase the options at his disposal, by getting card advantage and recovering his allies from the discard pile. 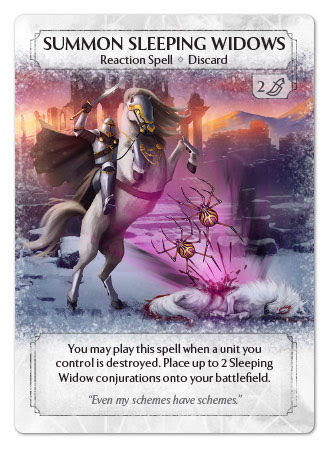 Bound Soul is essentially a more efficient version of the Ceremonial Die Power, with an increased action cost (Main instead of Side), but a much more affordable magic cost, and without the innate life loss the Ceremonial power entails. The chances your Stormwind Snipers are going to see the end of the round are ridiculously low, so you should already know you’ll need to recover them from your discard pile from time to time. 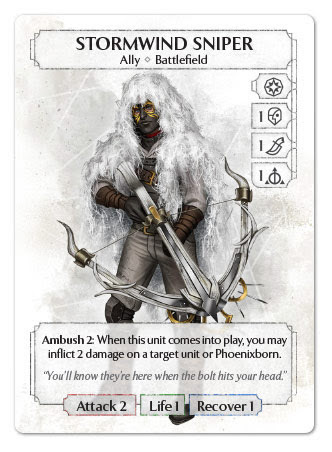 As long as you keep your life total above your opponent’s, spending the Ceremonial die and playing the Sniper is going to keep you ahead: you’ll take 2 damage to inflict 2 – or potentially 4 if you manage to attack – and that’s acceptable. Bound Soul gives you an even better life trade, and also allows you either to save cards or to hide your intentions to your opponent if you don’t have Ceremonial Power dice available. 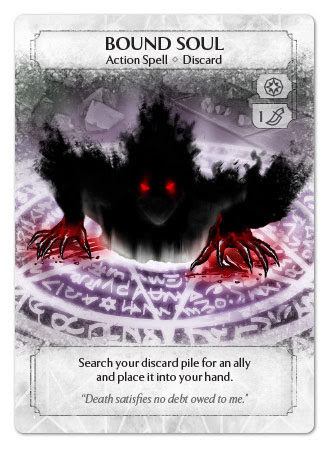 The Main Action cost on the other hand means you can’t recover an ally from your discard pile and play it in the same turn, which may allow your opponent to react. 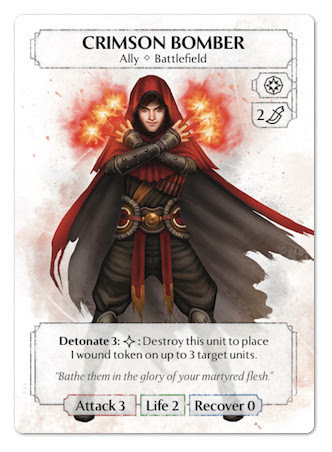 The biggest deal with this card, however, is that you have to spend a card slot to basically do something you are already entitled to do by just spending the die. It’s just a matter of efficiency, and to evaluate whether you can afford to take damage and possibly meditate some cards away or not. In the history of customizable card games, hand advantage has always been one of the main avenues for success. More cards in hand, means more options at your disposal, and with a 30-card deck, the probability an extra draw brings you that card you need in any given moment is not negligible. Enters Sleight of Hand, that allows you to draw 3 cards (that’s 1/8 of your deck in round 1!) for the cost of a Main Action, an Illusion Power and a Basic dice. One can argue that Spellboard also offers more options. 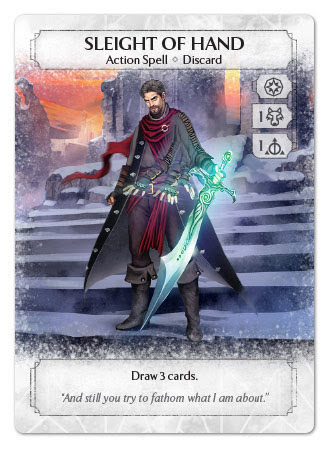 Essentially, you can treat each card in your spellboard as a card in your hand that your opponent knows of, you don’t discard after use, and doesn’t count in your draw cap at the beginning of the round. Thus, when you have a spellboard limit as low as 3, like Noah does, the value of having more cards in hand is increased, and that’s why Sleight of Hand can be a good asset in Noah’s deck. Usually, the best time to use it is at the beginning of the round, when you still have all of your dice to spend, and the three cards you draw are effectively extra options for your round. Essentially if you open a round with Sleight of Hand you are replacing a 5-cards, 10-dice hand with a 7-cards, 8-dice one. As Noah’s cards are generally cheap, costing no more than 2 – except for the Stormwind Sniper, it is generally a trade you can afford. 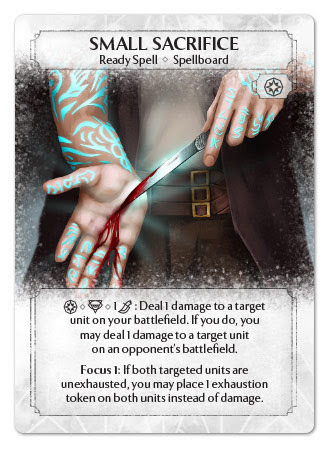 On the other hand, if you wait until later in the round before using this card, you are running the risk of drawing “dead” cards you would have drawn anyway in the following round: you have to weigh the expenditure of 2 dice against the usefulness of extra cards. Having a chance to get that Fade Away now, when you need it can often be a better proposition than saving 2 dice and having a slightly higher chance to get that same card next round, when you would have much more difficulties playing it. Unfortunately, I don’t have the perfect recipe for every situation, you’ll have to figure it out by yourself on a case-by-case basis; and that’s a good thing, otherwise the game would be predictable and boring. Noah’s reactions have a distinct purpose: to bring retribution to an opponent that steps too far, and to force them to reconsider their priorities. It can’t be helped: with a bunch of fragile units in his deck, Noah is eventually going to take damage. His large battlefield and relatively cheap units can protect him from attacks, but not eternally: any unit that blocks will be destroyed, no matter how weak the attacker is, and you’ll often trade favorably by having Noah guard a 1-2 damage attack and answer with an attack on your own rather than have one of your units die. Shadow Counter will ensure larger units (virtually any unit: 6 damage is huge!) will be out of their way, preferably before they had a chance to attack. The issue here is you need to be attacked, as you can’t trigger this reaction from the damage you take, for example, from recovering allies from the discard pile with the Ceremonial dice power, but knowing this card can be in your hand, your opponents will think twice before attacking with small units first to open the way for larger heavy-hitting ones. Noah is a master of tricks, and his Reaction Spells show it. 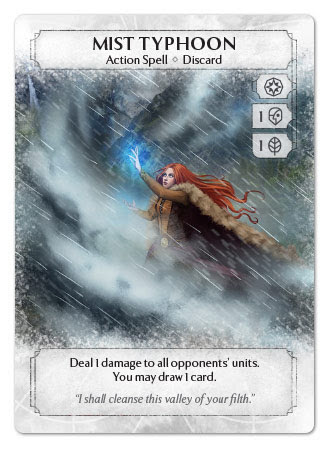 You have units on the board, the opponent wants to clear a path for a big attack but knows you may have Shadow Counter; thus they avoid attacking your troops directly with their weaker units, and opt to use direct damage to destroy them. They look so fragile, after all… and then it happens. They just killed a Masked Wolf or Stormwind Sniper and suddenly two Sleeping Widows have taken its place, threatening their Phoenixborn with 4 potential damage for just 2 dice. Unless they have some multi-target ability, like Mist Typhoon, One Hundred Blades (which maybe they can’t even use this turn as they may have already taken a Main Action) or Crimson Bomber, you are going to get them, perhaps putting in a Masked Wolf as a side action a big 6-damage attack. 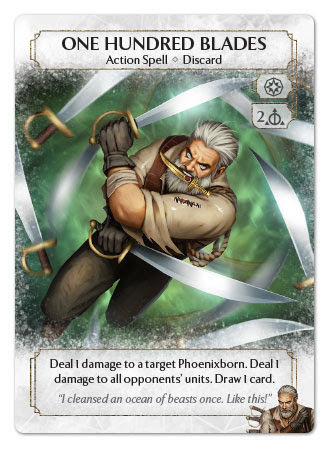 Noah is the only Phoenixborn featuring all of the five card types in his preconstructed deck; so, without further ado, let’s take a look at his Alteration Spells. I’ll be honest: Bring Forth is definitely hard to evaluate. I kind of like it, but it is so expensive and of a so limited use I understand why many consider it one of the worst cards in the Core Set. A +2 Attack and +1 Life modifier for 2 dice looks quite good on paper (although I think 1 Ceremonial and 1 Basic could have been a much more affordable cost), but it can only be attached to a unit with the Illusion ability, which in this deck (and for deckbuilding purposes, in the whole Core Set) means the False Demon and nothing else. With this spell attached, the False Demon becomes a 3/5 unit with Unit Guard at the expense of 4 dice. Overall that’s not a bad deal, and definitely, paying for a unit in two steps is less taxing than getting rid of 4 dice in a single go, but still 3 class dice and a basic is a lot even without mentioning its whooping 2-dice respark cost, and yet a brought forth False Demon dies 1 vs 1 against a Blood Archer (which costs the same) or a Hammer Knight (which costs 1 less). Nevertheless, this is one of the few ways this deck has to deal some decent damage to the opponent, so, even though possibly not a wonderful card, it has its uses. Last but definitely not least, Fade Away is the ultimate unit removal card. No escape here: the attached unit is destroyed at the end of the round, period. Insult to injury, if it was an ally, it is removed from the game. No Ceremonial Dice shenanigans allowed. The cost? a mere Illusion die. The big issue is that while it will wreck your opponent’s battlefield later, it can’t do anything to help you now. 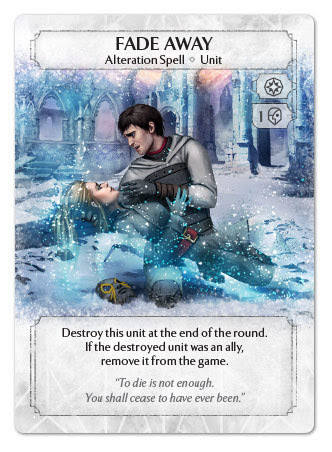 Moreover if your opponent discards it, or manages to make the attached unit leave play before it triggers, Fade Away is wasted. Two possible solutions here: first, you have to be patient, possibly take some damage, but save an illusion die and wait until the end of the Players Turns Phase, when the opponent has no more dice or effects to play. Then you hit with a last turn Fade Away they can’t do anything about. The second approach is to force the opponent to react to your play: you attach Fade Away and make them spend resources to counter it. The efficiency of this strategy greatly depends on how easy is for them to get rid of it, or to destroy the attached unit and recover it, of course. 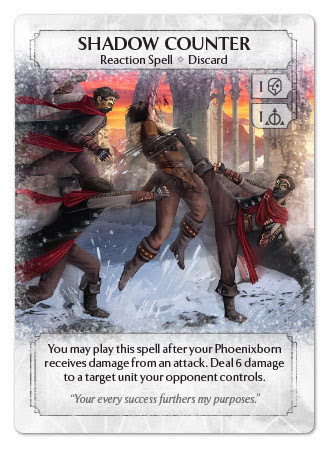 Lots of ways to hinder the opponents’ play, or force them to reconsider their strategy, especially with Noah’s Phoenixborn ability. Surprise effects and out-of-turn plays will make you hit the enemy when they have their guard down. Relatively cheap cards overall. Though you’ll lose units with ease, you can get them back to play as easily. No source of damage except for units, which are extremely fragile, and need to strike over and over again to close a game. Your battlefield will be shaky at best. The deck as a whole can be quite tricky to use, as there is no immediate strategy and requires a higher level of game knowledge. If you are approaching Ashes for the first time with Noah, expect sound defeats and don’t let them discourage you. Low spellboard value means the deck has to rely more on heavy card draw to have consistent performance. Next time, we’ll take a trip to the seaside and give a look at Rustwatch’s grizzled veteran Coal Roarkwin and his Iron Men (and Rhinos) deck.